Amazing footage shows a one-armed pool player absolutely destroying his opponent, with his skill far outweighing his disadvantage. CCTV footage, taken at an unknown location in China, shows the unnamed one-armed man playing – and absolutely smashing – a game of eight-ball against a friend. The far less proficient friend was permitted to go first and break. However, this was apparently not enough to give him an advantage and he ended up pocketing the cue ball by mistake. The friend watched him play; impressed and yet clearly frustrated as the one-armed man proceeded to sink each one of his solids. Using only his right arm, the extremely talented player expertly pocketed each of his balls. He held the cue with remarkable steadiness above the cloth; sometimes placing it on the edge of the pool table. He demonstrated powerful shots but also displayed plenty of flair and sophistication, leaving the remaining eight ball lined up to strike into the corner. The brilliant shot which won the game saw the one-armed man hit the eight ball; leading it to knock against one of his friend’s balls as it rolled towards the far pocket. Rightly proud of his considerable abilities, the video proceeds to shows the one-armed player celebrating his perfect victory; dancing with excitement. Back in 2017, World Disability Billiards and Snooker (WDBS) joined forces with the World Snooker Federation, the new International Federation which brings together amateur and professional snooker players across the globe. Working together, these two organisations hope to bring new opportunities for players with disabilities to participate in competitive, international and inclusive tournaments. Snooker and Billiards are among the few sports which can be played by anyone, regardless of age and gender, and the WDBS will give more chances to people with disabilities to meet up and play competitively. I would like to thank the EFDS for their specialist advice as creating the correct framework at this early stage is vital to our international success. Under the World Confederation of Billiards Sports and working with a number of global partners, we recently put together a fantastic bid to get cue sports included in the Olympics, and while this narrowly failed, we remain determined to get recognition in both the Olympic and Paralympic Games. Our sport is a sport for all and we strive to break down any boundaries and get more people involved at all levels. I shall be entering this disability Championship in Sept!!! 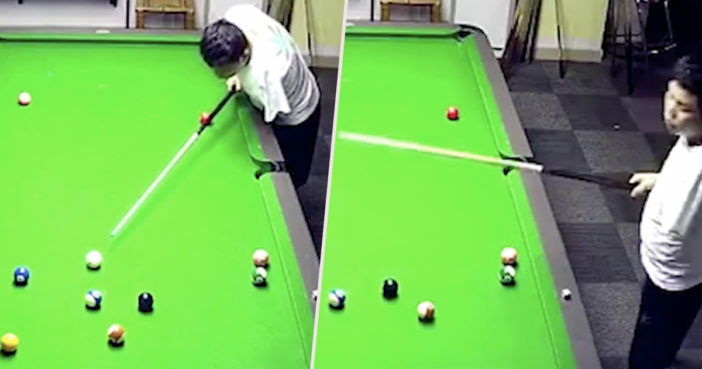 As this inspirational one-armed pool player has expertly demonstrated, physical challenges do not mean you cannot excel in your chosen sport.